2.Permanent moratorium on new pound net sets. Existing sets can no longer be added on to. Existing sets can be handed down to heirs and can be bought/sold/traded. If a set does not show landings for a three year period, permit is removed permanently. Establish a yearly pound net quota based on previous 5 year landings and cut that average by 35% to designate quota. 35% may be given back once fishery is deemed recovered. 3. 35 fish commercial gig limit, no season or designated work days limit is per boat no matter how many scfl holders are on board. Rec anglers have taken a 30% cut and have taken all cuts on flounder over the years. No more changes at all to recreational fishery. I would be so bold as to say the recreational cut has been closer to 90% or worse, because the population has been wiped out for purposes of comparison to historical flounder angling success. By that I mean we haven't been catching flounder at all because the population is COLLAPSED. In my efforts, no flounder in 4 years. Period. If the giggers and pounds catch the only fish, by and large, it means we're suffering from a lack of viable biomass for angling. This is state supported theft. The supplement was a farce, and if results are a benchmark for success, the supplement hasn't been a success. So called efforts to bring back SF are a charade. Remember, we debated the supplement here, and I believe the case can be made for it being an abject failure. Situation normal, you rat finks in our GA, who wouldn't give a crap if all the flounder in Carolina were stacked, packed and sent to Canada and New York. Collective apathy, deal making and destruction of this one time great fishery are squarely branded on your foreheads. Incompetence and bad will follow this idiotic trajectory, a shadow ever present on the August body. Thanks for NOTHING, dear sirs! One of the main problems in the flounder scenario, is the minimum size limit. Flounder over 12" tend to be female, and as flounder get even larger it is almost all female, with the largest being all female. By taking out the larger flounder we are taking away our breeders, and history and science have shown that this is detrimental to the species. I would rather that there not be a minimum size, and limit the take on the larger breeding females, i.e. limiting it to one trophy fish over a certain size per day(already a precedence with bluefish) . Many fisherman like to cook flounder whole, and it is tough to put a 15" flounder in a pan to do that. Not so, many are willing to fork out big money at seafood restaurants for whole cooked flounder, and the majority of those are not 15"(farm raised or imported). Also, 21+ inch flounder produce many eggs, which equals more fish in the long run. Did you know that a female S flounder does not become fecund until 16"? We are currently killing 90% plus juveniles and you want us to lower the size limit? We have been raising the size limit to increase the SSB. There are very few 21+ inch flounder. Anyway you slice it, the stock is overfished and overfishing continues unabated-for almost two decades. Since 85% of the fish are caught by the commercial sector, therein lies the only solution to the restoration of S. flounder. Stop the overfishing by the commercial sector. 15 in flounder should 1-1.25 lbs. assuming you get 50% that's not much. 17-18 inch fish will have doubled in weight.agree with Chris. And that raising of size limit increase has applied to commercial as well as recreational. How has that worked so far? As for 85% being caught by the commercial sector, there are trip tickets to show how many founder are commercially harvested, but none for the recreational catch so these numbers can be misleading. There needs to be a better way to determine the recreational take than current measures. I agree that flounder are in trouble, but I disagree on how management has been trying to solve it. According to DMF reports today the level of overfishing on southern flounder is improving so these size limit increases have worked. At 85%, that is one of the lowest assessments of rec harvest in some time. When I was on the southern flounder AC the DMF said 90% of all southern flounder landings in NC was from commercial fishing. Very interesting comment by Dr Scharf, chair of the Flounder AC, he stated on public record that we were not that far from having overfishing go above the threshold, but that it would require a 40% reduction in takes from the fishery. Anybody recall seeing that 40% number before??? Also confirmed what he told me when I asked him at one of the peer review days in New Bern, that we ARE and have been for a long time fishing on 2 juvenile year classes of fish. Anybody recall hearing that before??? As to a smaller size limit, that would be great, or even a slot limit would be great, but til the SSB increases we have to allow both males/females to reach maturity. That will NOT occur without a TAC or quote (both mentioned by Dr Scharf). It will be interesting to see the landings from 2017 which Dir Murphy said would be available in 9/10 months another full season of status quo flounder fishing across all sectors) and the MRIP data from other states. I'd say the August MFC meeting could be very interesting, perhaps the legislators, Gov and DEQ Secretary will attend and speak, we'll see. I remind all y'all, please continue the debate here, but in the same time it takes you to post here, you can email the MFC, NCDMF, Gov, GA, County Comms, and anybody you choose on this issue with your questions. IF YOU HAVE ANSWERS, EMAIL ME IMMEDIATELY! Good Fishing!!! (one day, hopefully)!!! The problem with smaller size limits or slot limits is that males are small rarely reach 14", not as common as females and spend most of their life in the ocean. They don't come inshore at the rate females do. I also would like to address something else said at the MFC meeting. 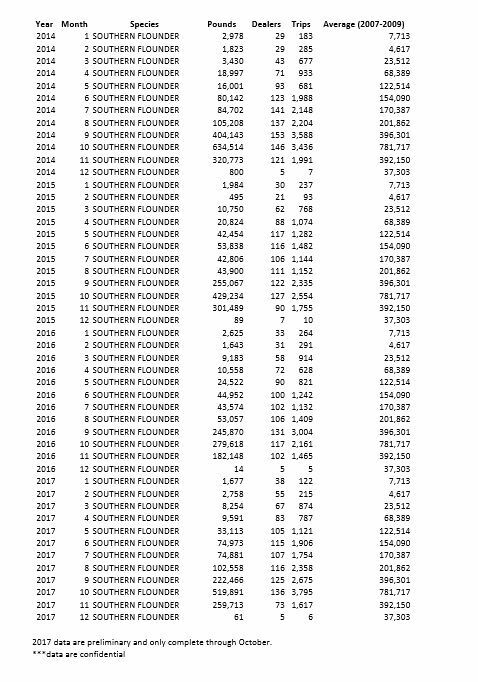 The attempt to say that poundage on commercial southern flounder harvest continues to be about the same year after year as if that statement attempts to say that fish production is fine. That is obviously wrong to any who understand what has happened and being said. 20 years ago we allowed 10" fish to be harvested. Today it is a 15 inch fish. What does a 10 inch flounder weigh? What does a 15 inch flounder weigh? If the total harvest poundage is staying the same and since we do not put limits on the number of fish that can be harvested then it is obvious that if we were harvesting the same number of fish today as 20 years ago the total poundage we are landing today would be significantly greater. It isn't, therefore we obviously are harvesting far fewer fish even though in theory we should be harvesting the same number of fish at greater sizes thus reflecting greater weight. That isn't happening, meaning there aren't as many fish out there as there were 20 years ago reaching sizes we cull to by hand as with recs or by mesh as we do with commercials. The number of fish is definitely less, even to a layman. And this layman method is now backed up by scientific assessment. But the layman method deals in reality in the end, not trends and excerpts, it just winds up proving they ain't where they used to be in numbers they once were. And Chuck is right. Write or call anyone that can make a difference and remind them that protecting our natural resources is part and parcel to being an elected official or state employee at any level. For them to ignore you is "arbitrary and capricious". For those interested as to why the Commission's hands are tied on addressing what many see to be a clear and present need for action on S Flounder, please see the "lawsuit" settlement terms below from the May-2017 Business Meeting. Moved out of closed session without objection. • A 5 ¾ -inch mesh size for escape panels in pound nets. Additionally, in accordance to the terms of the agreement-in-principle, the commission will not seek to adopt a supplement to the Southern Flounder Fishery Management Plan until it acts to adopt an amendment to the Plan. The agreement-in-principle also required plaintiffs to withdraw their complaint with prejudice and waive and release of any and all claims related to the action that were or could have been brought against the defendants on or before the filing of the plaintiffs’ Amended Complaint (i.e. September 30, 2016). Reynolds told the commission that these terms will be formalized through an agreement. Motion by Rick Smith to accept the terms of the agreement reached in principle during mediation on May 11, 2017 pertaining to the matter of CCFA et al vs. NCDEQ et. al which will be finalized with a settlement agreement at a future date. Second by Joe Shute. Motion carries 8-0 with one abstention. Due to the settlement agreement above, the Commission agreed not to use the powers and duties vested to it under- § 143B-289.52 allowing it to take temporary management measures. § 143B-289.52. Marine Fisheries Commission - powers and duties. a. Time, place, character, or dimensions of any methods or equipment that may be employed in taking fish. b. Seasons for taking fish. c. Size limits on and maximum quantities of fish that may be taken, possessed, bailed to another, transported, bought, sold, or given away. (2) To provide fair regulation of commercial and recreational fishing groups in the interest of the public. (3) To adopt rules and take all steps necessary to develop and improve mariculture, including the cultivation, harvesting, and marketing of shellfish and other marine resources in the State, involving the use of public grounds and private beds as provided in G.S. 113-201. (4) To close areas of public bottoms under coastal fishing waters for such time as may be necessary in any program of propagation of shellfish as provided in G.S. 113-204. (5) In the interest of conservation of the marine and estuarine resources of the State, to institute an action in the superior court to contest the claim of title or claimed right of fishery in any navigable waters of the State registered with the Department as provided in G.S. 113-206(d). (6) To make reciprocal agreements with other jurisdictions respecting any of the matters governed in this Subchapter as provided by G.S. 113-223. (7) To adopt relevant provisions of federal laws and regulations as State rules pursuant to G.S. 113-228. (8) To delegate to the Fisheries Director the authority by proclamation to suspend or implement, in whole or in part, a particular rule of the Commission that may be affected by variable conditions as provided in G.S. 113-221.1. (9) To comment on and otherwise participate in the determination of permit applications received by State agencies that may have an effect on the marine and estuarine resources of the State. (10) To adopt Fishery Management Plans as provided in G.S. 113-182.1, to establish a Priority List to determine the order in which Fishery Management Plans are developed, to establish a Schedule for the development and adoption of each Fishery Management Plan, and to establish guidance criteria as to the contents of Fishery Management Plans. (11) To approve Coastal Habitat Protection Plans as provided in G.S. 143B-279.8. (12) Except as may otherwise be provided, to make the final agency decision in all contested cases involving matters within the jurisdiction of the Commission. (13) To adopt rules to define fishing gear as either recreational gear or commercial gear. (1) To implement the provisions of Subchapter IV of Chapter 113 as provided in G.S. 113-134. (2) To manage the disposition of confiscated property as set forth in G.S. 113-137. (3) To govern all license requirements prescribed in Article 14A of Chapter 113 of the General Statutes. (4) To regulate the importation and exportation of fish, and equipment that may be used in taking or processing fish, as necessary to enhance the conservation of marine and estuarine resources of the State as provided in G.S. 113-170. (5) To regulate the possession, transportation, and disposition of seafood, as provided in G.S. 113-170.4. (6) To regulate the disposition of the young of edible fish, as provided by G.S. 113-185. (7) To manage the leasing of public grounds for mariculture, including oysters and clam production, as provided in G.S. 113-202. (8) To govern the utilization of private fisheries, as provided in G.S. 113-205. (9) To impose further restrictions upon the throwing of fish offal in any coastal fishing waters, as provided in G.S. 113-265. (10) To regulate the location and utilization of artificial reefs in coastal waters. (11) To regulate the placement of nets and other sports or commercial fishing apparatus in coastal fishing waters with regard to navigational or recreational safety as well as from a conservation standpoint. (1) The opening and closing of coastal fishing waters, except as to inland game fish, whether entirely or only as to the taking of particular classes of fish, use of particular equipment, or as to other activities. (2) The possession, cultivation, transportation, importation, exportation, sale, purchase, acquisition, and disposition of all marine and estuarine resources and all related equipment, implements, vessels, and conveyances as necessary to carry out its duties. (d) The Commission may adopt rules required by the federal government for grants-in-aid for coastal resource purposes that may be made available to the State by the federal government. This section is to be liberally construed in order that the State and its citizens may benefit from federal grants-in-aid. (d1) The Commission may regulate participation in a fishery that is subject to a federal fishery management plan if that plan imposes a quota on the State for the harvest or landing of fish in the fishery. The Commission may use any additional criteria aside from holding a Standard Commercial Fishing License to develop limited-entry fisheries. The Commission may establish a fee for each license established pursuant to this subsection in an amount that does not exceed five hundred dollars ($500.00). (d2) To ensure an orderly transition from one permit year to the next, the Division may issue a permit prior to July 1 of the permit year for which the permit is valid. Revenue that the Division receives for the issuance of a permit prior to the beginning of a permit year shall not revert at the end of the fiscal year in which the revenue is received and shall be credited and available to the Division for the permit year in which the permit is valid. (e) The Commission may adopt rules to implement or comply with a fishery management plan adopted by the Atlantic States Marine Fisheries Commission or adopted by the United States Secretary of Commerce pursuant to the Magnuson-Stevens Fishery Conservation and Management Act, 16 U.S.C. § 1801, et seq. Notwithstanding G.S. 150B-21.1(a), the Commission may adopt temporary rules under this subsection at any time within six months of the adoption or amendment of a fishery management plan or the notification of a change in management measures needed to remain in compliance with a fishery management plan. (e1) A supermajority of the Commission shall be six members. A supermajority shall be necessary to override recommendations from the Division of Marine Fisheries regarding measures needed to end overfishing or to rebuild overfished stocks. (f) The Commission shall adopt rules as provided in this Chapter. All rules adopted by the Commission shall be enforced by the Department of Environmental Quality. (g) As a quasi-judicial agency, the Commission, in accordance with Article IV, Section 3 of the Constitution of North Carolina, has those judicial powers reasonably necessary to accomplish the purposes for which it was created. (h) Social security numbers and identifying information obtained by the Commission or the Division of Marine Fisheries shall be treated as provided in G.S. 132-1.10. For purposes of this subsection, "identifying information" also includes a person's mailing address, residence address, date of birth, and telephone number. Also applicable under the settlement terms is agreement not to use supplement action under § 113-182.1. (e1) Fishery Management Plans. (e1) If the Secretary determines that it is in the interest of the long-term viability of a fishery, the Secretary may authorize the Commission to develop temporary management measures to supplement an existing Fishery Management Plan pursuant to this subsection. Development of temporary management measures pursuant to this subsection is exempt from subsections (c), (c1), and (e) of this section and the Priority List, Schedule, and guidance criteria established by the Marine Fisheries Commission under G.S. 143B-289.52. During the next review period for a Fishery Management Plan supplemented pursuant to this subsection, the Commission shall either incorporate the temporary management measures into the revised Fishery Management Plan or the temporary management measures shall expire on the date the revised Fishery Management Plan is adopted. (a) The Department shall prepare proposed Fishery Management Plans for adoption by the Marine Fisheries Commission for all commercially or recreationally significant species or fisheries that comprise State marine or estuarine resources. Proposed Fishery Management Plans shall be developed in accordance with the Priority List, Schedule, and guidance criteria established by the Marine Fisheries Commission under G.S. 143B-289.52. (1) Contain necessary information pertaining to the fishery or fisheries, including management goals and objectives, status of relevant fish stocks, stock assessments for multiyear species, fishery habitat and water quality considerations consistent with Coastal Habitat Protection Plans adopted pursuant to G.S. 143B-279.8, social and economic impact of the fishery to the State, and user conflicts. (2) Recommend management actions pertaining to the fishery or fisheries. (3) Include conservation and management measures that will provide the greatest overall benefit to the State, particularly with respect to food production, recreational opportunities, and the protection of marine ecosystems, and that will produce a sustainable harvest. (4) Repealed by Session Laws 2010-13, s. 1, effective June 23, 2010. (5) Specify a time period, not to exceed two years from the date of the adoption of the plan, to end overfishing. This subdivision shall not apply if the Fisheries Director determines that the biology of the fish, environmental conditions, or lack of sufficient data make implementing the requirements of this subdivision incompatible with professional standards for fisheries management. (6) Specify a time period, not to exceed 10 years from the date of the adoption of the plan, for achieving a sustainable harvest. This subdivision shall not apply if the Fisheries Director determines that the biology of the fish, environmental conditions, or lack of sufficient data make implementing the requirements of this subdivision incompatible with professional standards for fisheries management. (7) Include a standard of at least fifty percent (50%) probability of achieving sustainable harvest for the fishery or fisheries. This subdivision shall not apply if the Fisheries Director determines that the biology of the fish, environmental conditions, or lack of sufficient data make implementing the requirements of this subdivision incompatible with professional standards for fisheries management. (c) To assist in the development of each Fishery Management Plan, the Chair of the Marine Fisheries Commission shall appoint a fishery management plan advisory committee. Each fishery management plan advisory committee shall be composed of commercial fishermen, recreational fishermen, and scientists, all with expertise in the fishery for which the Fishery Management Plan is being developed. (e) regarding the preparation of each Fishery Management Plan. Before submission of a plan for review by the Joint Legislative Commission on Governmental Operations, the Department shall review any comment or recommendation regarding the plan that a regional advisory committee submits to the Department within the time limits established in the Schedule for the development and adoption of Fishery Management Plans established by G.S. 143B-289.52. Before the Commission adopts a management measure to implement a plan, the Commission shall review any comment or recommendation regarding the management measure that a regional advisory committee submits to the Commission. (d) Each Fishery Management Plan shall be reviewed at least once every five years. The Marine Fisheries Commission may revise the Priority List and guidance criteria whenever it determines that a revision of the Priority List or guidance criteria will facilitate or improve the development of Fishery Management Plans or is necessary to restore, conserve, or protect the marine and estuarine resources of the State. The Marine Fisheries Commission may not revise the Schedule for the development of a Fishery Management Plan, once adopted, without the approval of the Secretary of Environmental Quality. (e) The Secretary of Environmental Quality shall monitor progress in the development and adoption of Fishery Management Plans in relation to the Schedule for development and adoption of the plans established by the Marine Fisheries Commission. The Secretary of Environmental Quality shall report to the Joint Legislative Commission on Governmental Operations within 30 days of the completion or substantial revision of each proposed Fishery Management Plan. The Joint Legislative Commission on Governmental Operations shall review each proposed Fishery Management Plan within 30 days of the date the proposed Plan is submitted by the Secretary. The Joint Legislative Commission on Governmental Operations may submit comments and recommendations on the proposed Plan to the Secretary within 30 days of the date the proposed Plan is submitted by the Secretary. (f) The Marine Fisheries Commission shall adopt rules to implement Fishery Management Plans in accordance with Chapter 150B of the General Statutes. (1) Current participation in and dependence on the fishery. (2) Past fishing practices in the fishery. (3) Economics of the fishery. (4) Capability of fishing vessels used in the fishery to engage in other fisheries. (5) Cultural and social factors relevant to the fishery and any affected fishing communities. (6) Capacity of the fishery to support biological parameters. (7) Equitable resolution of competing social and economic interests. (8) Any other relevant considerations. For those at the MFC meeting and listening on WebEx how many times did you hear both Dr. Scharf and Director Murphey specifically mention the unique biology of Southern flounder? Multiple times for each. This subdivision shall not apply if the Fisheries Director determines that the biology of the fish, environmental conditions, or lack of sufficient data make implementing the requirements of this subdivision incompatible with professional standards for fisheries management. Motion by Chuck Laughridge to amend the Rose motion to place in the following order these FMPs: Southern Flounder, to begin as soon as the peer reviewed stock assessment is completed; Estuarine Striped Bass, to pursue this FMP no earlier than 2019, assuming a supplement requested by the MFC is in place addressing issues in the Central-Southern Management Area; Blue Crab, to begin as scheduled, Spotted Seatrout, to begin in 20192020; Shrimp, to begin as soon as the three-year study is complete, and no later than February 2018. All other FMPs as presented by the NCDMF. Second by Rick Smith. Motion to amend carries 5-3 Motion to approve by Chuck Laughridge. Second by Rick Smith. Motion carries 5-3. The stock assessment shows the fishery is both overfished and overfishing is occurring, and has been for years in direct violation of § 113-182.1 (b)(5) and (b)(6). 15A NCAC 03H .0103 gives authority to the Director to use proclamation authority to address certain variable conditions not set forth in MFC rule. (a) It is unlawful to violate the provisions of a proclamation issued pursuant to a rule of the Marine Fisheries Commission, as provided in G.S. 113-221.1. (8) protection of public health related to the public health programs that fall under the authority of the Marine Fisheries Commission. History Note: Authority G.S. 113-134; 113-135; 113-182; 113-221.1; 113-221.2; 113-221.3; 143B-289.52; Eff. January 1, 1991; Amended Eff. March 1, 1994; September 1, 1991; Temporary Amendment Eff. July 1, 1999; Amended Eff. May 1, 2017; April 1, 2011; August 1, 2000. Under multiple conditions listed in (b) above, it appears that the Director is well with in his authority to issue a proclamation to reduce S Flounder harvest to end overfishing and come in compliance on the requirements of § 113-182.1 (b)(5) and (b)(6). What we heard the Director clearly and emphatically state was that he would not consider using his proclamation authority. To emphasize his refusal to consider a proclamation, Murphey used a very specific legal term. Murphey stated that the biology of the fish didn't require immediate action and to issue a proclamation for such action would in his opinion be- arbitrary and capricious. We then heard an intense discussion between the Commission and Murphey about the urgency, a potential motion asking for a proclamation and the timeline under the FMP process to address ending overfishing and achieving sustainable harvest. We heard the professional opinion of the MFC Science Seat say that the S Flounder stock was at the top of the list as one of the worst stock status reports that he had reviewed in his career and needs immediate attention. In the end, it appears that the people of NC's public trust resource will continue to be overfished for at least the next three years- the minimum time a full FMP amendment will take plus the delaying action of 10-signatures requesting administrative review. A further review of the data and facts changes the Director's mind about using proclamation authority. The Secretary decides under his own volition (terms of the settlement agreement prevent the MFC from requesting one) that a Supplement is justified. "We the people" of this public trust resource successfully petition the court to review the settlement agreement in order to consider new and compelling information that supports reinstituting all of the rules of the 2015 Supplement A to Amendment 1. All of the actions above appear to be moot points given that Director Murphey (the top NC marine scientist) went on public record with his personal opinions that the "biology" of the fish requires no such action and that such action would be "arbitrary and capricious". Hopefully Director Murphey will use his science and management skills to expedite the FMP process in order to quickly address this issue. Three more years overfishing an overfished stock consisting predominately of two juvenile year classes is unacceptable. Both Murphey and Scarf pointed out the resiliency of the S Flounder stock and for that they are correct. The stock has survived mismanagement for years- 15 to 20 years. However, as Commissioner Kornegay pointed out, with the fishery being almost solely concentrated on two year classes of juvenile fish, we are potentially one or two recruitment failures away from a total collapse. The 2018 cold-stun event could be that tipping point. On the oyster issue, we heard Director Murphey say that a couple of lawsuits could shutdown the whole bottom/water column lease program as the Division doesn't have the staff or the money to defend the program. Would the Division fold and make a proclamation to end overfishing should it be sued? No! It is a given that if Murphey makes that proclamation now, after the arbitrary and capricious comment, then the NCFA will sue him. If truth be known, I'll guess that not making a proclamation to end overfishing, with cover of science, was a calculated risk as to which side would sue or not sue. Taking the FMP approach was the safest bet. Jerry Schill (NCFA) wants more delay and has shown his willingness to sue. The recreational/conservation side has only sued once and it was driven by federal issues. Maybe some entity or individual will step up to the plate and sue the Director and the Division. A settlement closing the S Flounder fishery until the FMP is completed and implemented is always a possibility...not as good as sound and timely management...but still an option. Three years is too long to delay...I mean wait. So what is the difference between an amendent and a supplement? And does the current director not think the latest southern flounder study is sufficient? Catching about same poundage of fish every year with 50% reduction in participants and effort with gear changes and time constraints but the fishery is collasping. Especially when almost all the fish are caught before they are mature enough to spawn. The stock has been overfished since 2000 (the terminal year of the first assessment). Fisheries independent data trumps fisheries dependent data. Exactly. If you are catching the same poundage using 15 inch fish as you used to at 10 and 11 inches with no limit on the number of fish then you are obviously catching far fewer fish than you used to. If you were catching the same number of fish today as 20 years ago the poundage should be nearly four times what it was then. There are simply fewer fish just as the stock assessment shows. I understand my numbers are not exact but the number of fish above the minimum size today would be no more or less than today. At some point we have to stop putting off rebuilding. While I agree likely less fish in absolute numbers are being harvested as the minimum has increased and rebuilding is needed, you are making the assumption that all fish harvest when the minimum was 10" were 10" and all fish harvested when minimum 15" were 15". And with the gillnet closures, are we harvesting ~ same poundage with less effort (other than last two years). This may be spurious as well. Why don't you answer you're own questions and post the answer here. Enquiring minds want to know! You clearly chose to use only part of what I wrote almost 13 hours after I wrote it. As far as gillnets versus pound nets, do we have to drag out old charts yet again and show you yet again that when monofilament gillnets first started being used in the 1970's that they didn't really add to the overall harvest numbers but merely took from the pound net fishery? Those old charts, given to us by the DMF when Jess Hawkins was running the southern flounder FMP development the first time, also seemed to show that if the gillnets get packed up, the pound nets will catch most all of what the gillnets used to unless the state via the MFC or the legislature closes the season early. So any way you view it, in forms that the state provides, the poundage remains pretty much the same, with or without gillnets, but the number of fish definitely is less. Again.....if everything else remains the same when you went from 10 inches to 15 inches there would be just as many fish over the minimum by 20% today as then so poundage with the same number of harvested fish would be far heavier today than then. That same Texas growth chart shows that a 28 inch southern flounder weights over 9 pounds. From Louisiana we get this......."Male and female southern flounder are almost like two different species of fish. Males grow slower and have a short life span, almost never living over 3 years old or growing over 14 inches long. Females live longer and can grow to 28 inches. Also, after their first year of life, males live mostly in offshore waters." From NC we get this...."Southern flounder (Paralichthys lethostigma) are a bottom-dwelling species found in the Atlantic Ocean and estuaries from northern Mexico to Virginia. This species supports important commercial and recreational fisheries along the U.S. South Atlantic and Gulf coasts and are particularly important to fisheries in North Carolina. The biological unit stock for southern flounder inhabiting North Carolina waters may include other southern states based on evidence from tagging and genetic studies, as well as differences in aging structures, which indicate mixing of southern flounder from North Carolina to Florida. Evidence also suggests some adult southern flounder may return to the estuaries after spawning in the ocean, while others may remain in the ocean. Tagged fish are typically recaptured south of tagging locations and often in other states once in the ocean. Limited data from South Carolina and Georgia tagging programs suggest a low probability of adult movement from South Carolina or Georgia to North Carolina waters. Data collected from fall fisheries by the North Carolina Division of Marine Fisheries suggests that with the onset of maturity, fish of both sexes migrate out of inlets to ocean waters in the fall. Southern flounder can produce approximately 3 million eggs per female in multiple spawning events in a season, and spawning is thought to take place between November and April. Larval southern flounder pass through inlets within 30 to 45 days of hatching and settle throughout the sounds and rivers in the winter and early spring. Nearly half of female flounder are thought to be mature by ages 1 and 2 (at approximately 16 inches). Fish collected in the ocean tend to be larger and older fish with females attaining larger sizes. The largest southern flounder observed in North Carolina was a 33 inch total length female and a 20 inch male. The maximum observed age was 9 for a female and 6 for a male; southern flounder captured in North Carolina represent the oldest ages observed throughout the species range." So when we say our laws are such that over 85% of our harvest are on fish less than 2 years old, and that only half of southern flounder females have laid eggs at 16 inches, and we are killing them at 15 then what we are really saying is that we are only allowing half of our potential egg layers to be protected, and then we are giving up all the fish that could have lived 4 or five years, or longer, because we want that optimum sized commercial fish. In other words...perfect example of management for harvest rather than abundance. Imagine if industry operated in such a way that they simply gave up half their production potential. My bet the stockholders would be raising hell. And yes....the law says that is what NC is managing for, optimum harvest rather than abundance.....but who influenced the law makers for that to happen? So call us stockholders or stakeholders.....the hell raising is just beginning on continuing to tolerate an overfished fishery. Ray lets not forget we went from 3000yrds everywhere in N.C. to 2000yrds and alot of places only get 1000yrds for a few yrs now.Flounder are in the same condition as they where 28yrs ago when i 1st started in my area anyway.Now down south in Giggers Land they might be in bad shape but up here we don't have the crowd decimating all shorelines 7-8 months a year.Believe it or not thats a big problem and 1 of the main problems down south. Well from 2012 to 2016 (last year with complete data), gillnet trips dropped from 14,417 to 8,422. But then, this is just looking at two sets of data w/o any other context, e.g., increase in minimum size, weather, estimated year-class size etc. Floundermn....yes sir, but again, what the gillnets miss the pounds will sweep, they always have because flounder follow the same path to the sea each year. Those pound net placements aren't there because they are at the back door of someone's home. As far as the giggers. Hmm....where were you last week when we were trying to take commercial fishing licenses from recs who simply want to gig all night with no limits? Somehow I missed you asking for that improper use of holding a commercial license to stop. Were you fishing, out of town, or exactly what was it? November-2017 landings will certainly grow as additional trip tickets are completed pushing the YTD landings above 1.31-million pounds. Why not look at the incomplete data set for 2017? Wow- landings back up to 1,309,936 with Nov data being incomplete. How did Hurricane Mathew affect 2016 landings? Landings for 2017 certainly appear to be part of the normal range. Doesn't look like we reduced effort much based on landings. Gigging trips certainly aren't down. Pounds net trips appear static. 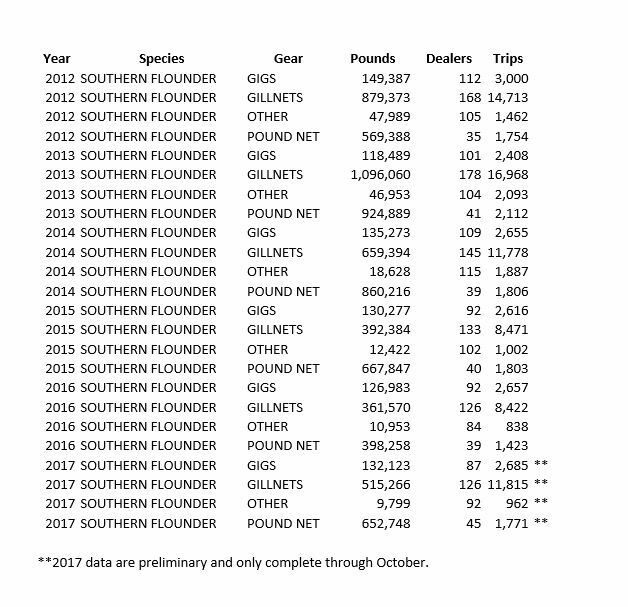 Gillnet trips appear to be up 40% in 2017 compared to the previous two years. ...and we wonder why Southern flounder aren't recovering. ...and most of us wonder why the Director failed to use his proclamation authority. Does it strike anyone else as an absolute waste of our resource to allow bycatch in the gillnet fisheries when they are only landing on average 52-pounds of flounder per trip? Yes- 52-pounds of flounder PER TRIP in our anchored large-mesh gill net fishery! ...and for those 52-pounds of flounder they can legally keep 7-red drum (as "bycatch") in the slot from 18" to 27" long. What do those seven slot red drum weigh? How many red drum above and below the slot became dead regulatory discards? Pound nets land 376-pounds of flounder per trip. Given what Ray said above about gillnets stealing from pound net landings and given that we know the fishery needs to give up 40% of its landings at minimum to become sustainable, how can NC continue to justify endangered species ITPs for the flounder fishery? Pound nets and gigs can land every pound the Southern flounder fishery can afford to give! ANYONE else beside me come to the conclusion that the NCDMF was fighting so hard to discredit the 2015 Handley study because of one fact! At minimum, 20% of "inactive licenses" are actively fishing with the vast majority actively fishing in the anchored gillnet fisheries. That fact puts Director Murphey in direct violation of the terms of the ITP requirement for a minimum % of observed trips in the anchored gillnet fisheries. Are ITPs not based on NEED? Where is the Need for anchored gillnets in the Southern flounder fishery? There is the first lawsuit that needs to be filed.